"Hi, Can anyone please help me on how to transfer messages from iPhone to iPhone since I just bought an iPhone 8. I really want my messages transferred to the new device. My iPhone 8 is running iOS 12. Please advice something." It is a demand for most iPhone users who bought a new iPhone to transfer their text messages to their new device. But since new iPhone models that have just been launched are all the rage now, the query gained great popularity these days, which is what brought us here. In this post, we are going to explain you how to transfer messages from iPhone to iPhone using the most efficient way. 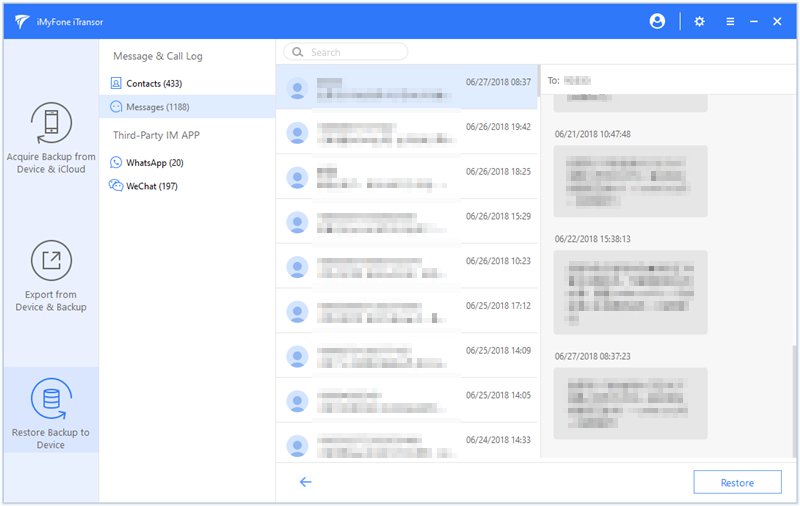 An outstanding way to transfer messages from iPhone to iPhone is through iMyFone iTransor, a professional tool to backup and restore the data in the iPhone. You can backup and restore your device including iPhone 8 and iPhone X in a flexible way. 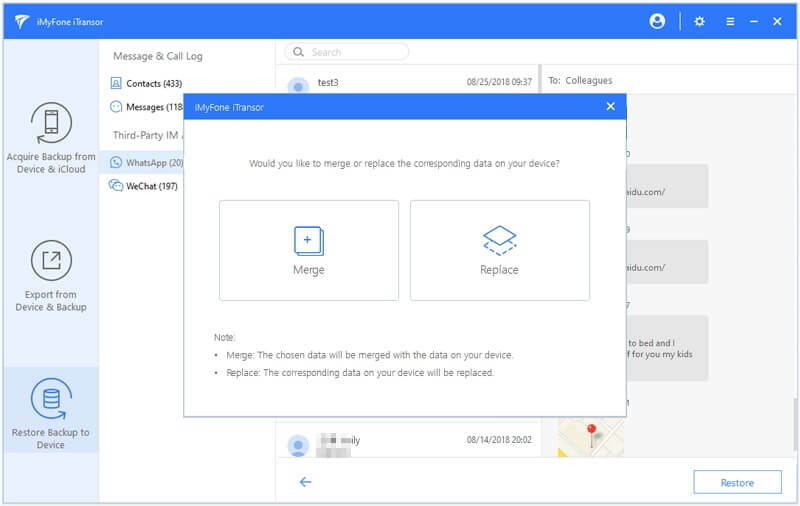 What's more, the tool is able to fully support the iOS 12.
iTransor is an amazing tool, which can selectively backup and restore the data on your device. 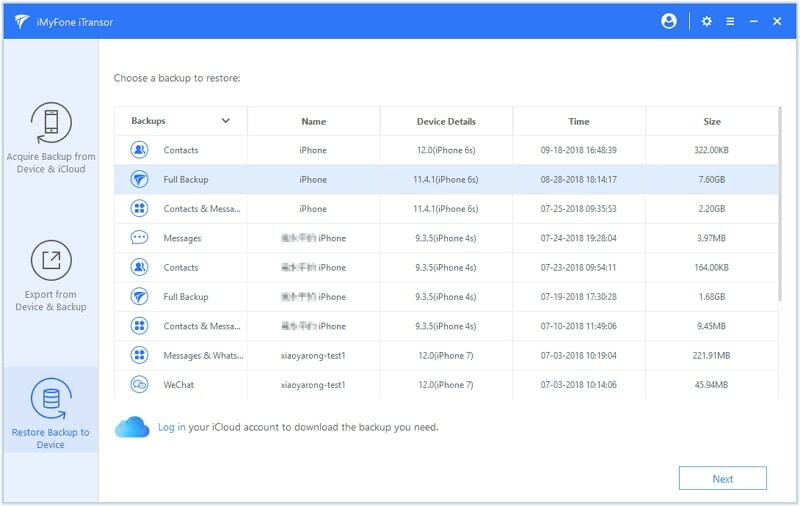 You can smoothly backup or restore whole iPhone or only contacts, messages, WhatsApp or WeChat if you need. All the backup files will be stored on your computer and you don't need to worry that your previous backup will be overwritten. iMyFone iTransor is completely safe and easy to use. 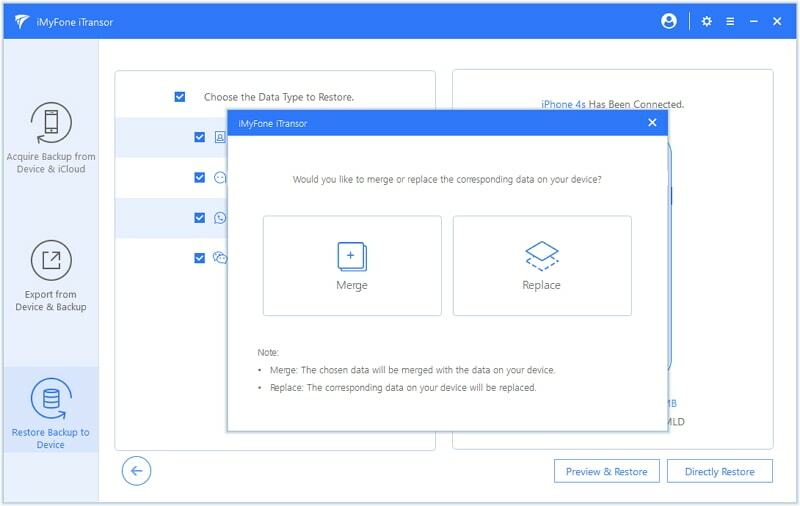 The users can selectively restore their device from their iTunes or iCloud backup.You can merge the data in backup with the current data on your device. More that 20 types of data in all the backups you made with iTunes, iCloud or iMyFone iTransor can be extracted using this tool. 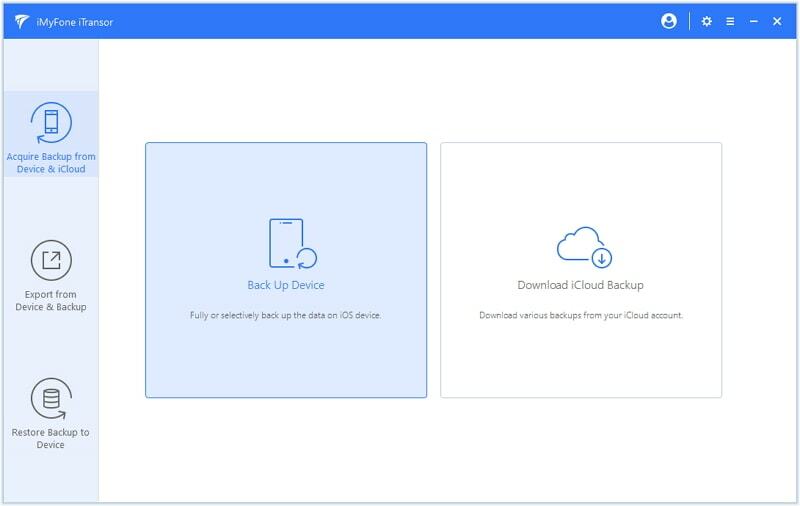 Step 1 – After installing the program, launch it on your PC and then go to the 'Acquire Backup from Device & iCloud' given on the left panel. Click on 'Back Up Device' from the next interface now. Step 2 – Connect your iPhone A and make it detectable by trusting the computer. The right column will provide two options. You need to select 'Select One or More Data Type(s)' and check the box next to 'Messages'. Then click 'Back Up'. Step 3 – After a short while, your messages will be backed up safely. 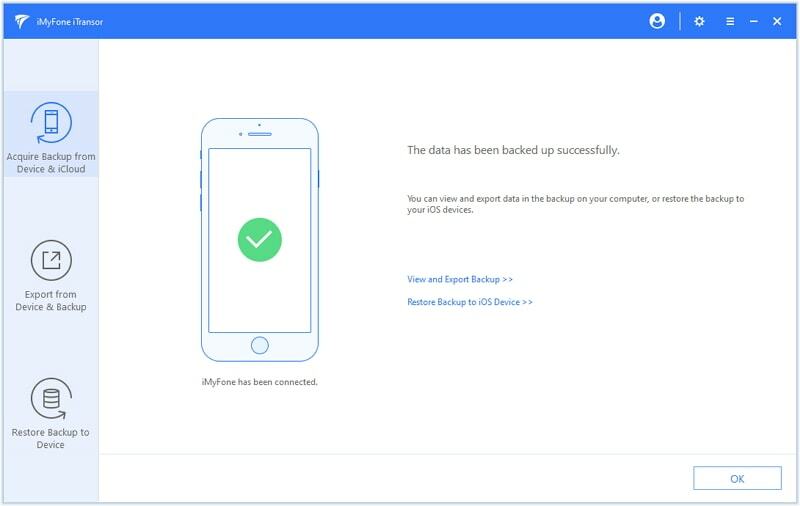 You will be able to export or restore the data in the backup file to iPhone B. Since you have just made a message backup of an old iPhone, you can now just restore the backup to your new iPhone or another iPhone. In this way, you will succeed to transfer messages from iPhone to iPhone using iMyFone iTransor. Step 1 – Open iTransor and click on 'Restore Backup to Device' from the left panel. A list of backup file will be visible to you now. You need to select the one backup file you made with iTransor previously. On choosing it, click on 'Next' button. Step 3 – Connect your iPhone B to the computer. Select 'Preview & Restore' option or 'Directly Restore' option. If you choose direct restore function, your messages will directly restore to the device. If you click the preview and restore option, you can preview your messages first. Step 3 – Before restoring and finishing the process, you will be asked to choose between 'Merge' and 'Replace' options. Choose the one depending on your need and complete the restoring of messages. Users, who use iTunes or iCloud to backup their device data, end up overwriting their complete device with the backup data. What if you have the privilege to selectively transfer the data in the backup? With iMyFone iTransor, you can make it. 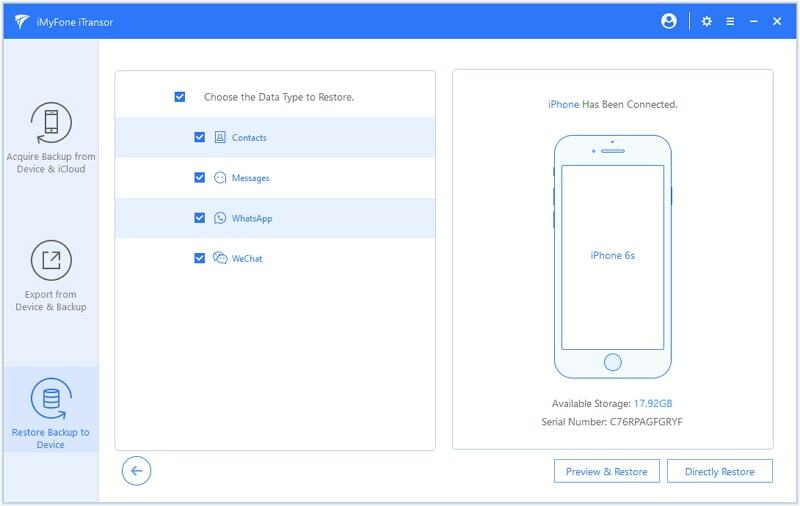 You not just have the power to restore Messages Backup made with iMyFone iTransor, but are also able to restore only the messages from iTunes/iCloud backup file or the full backup made by iMyFone iTransor, without overwriting any other data. Here we show an example to tell you how to transfer messages from a backup to another iPhone including the devices running iOS 12. Step 1 – In order to get the messages restored from iTunes backup, open iTransor and get to the 'Restore Backup to Device' option. When you find the list of backups on your screen, choose one needed iTunes backup from it and click on 'Next' button subsequently. 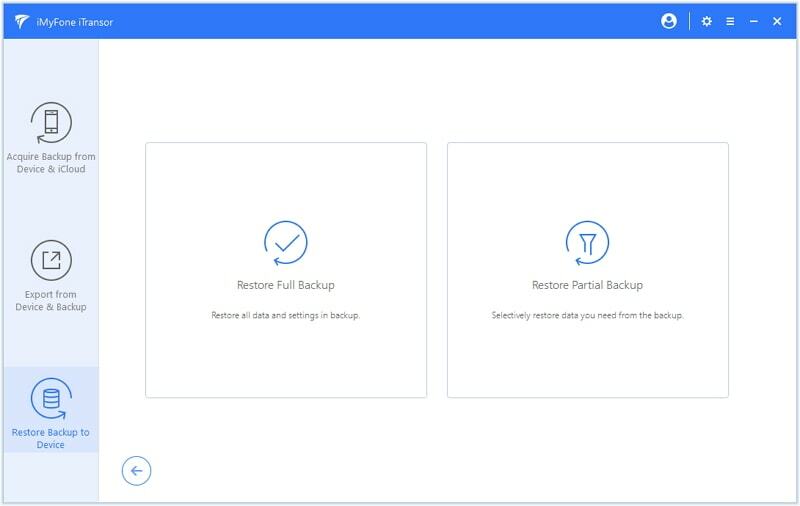 Step 2 – As the second step, click on 'Restore Partial Backup' from the 2 options. Step 3 – Now, you need to choose Messages and connect your iPhone. Then select the one from 'Preview & Restore' and 'Directly Restore' option. If you pick out 'Directly Restore', simply go to the next steps since you will not be able to preview the messages then. If you pick out the first option, you can preview the messages before restoring. 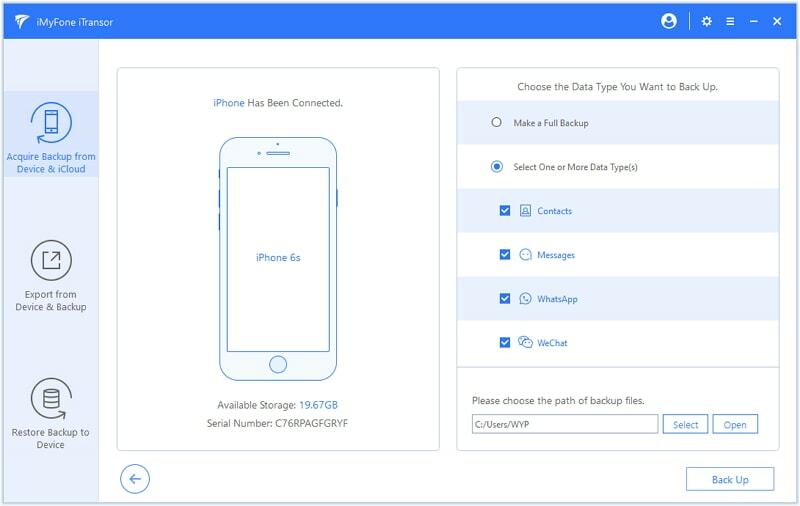 Step 4 – Now, decide if you want to combine the new messages with the existing ones on your iPhone or you want to get the old data completely replaced with the data in backup file. The two options which are 'Merge' and 'Replace' will help you to fulfill this purpose. We always focus on providing the useful and helpful information to the users so that they don't find themselves confused or in trouble in any way. Also, it is our attempt that the users get the easiest tip for whatever problem they are facing. We hope that you learnt this easiest way on how to transfer messages from iPhone to iPhone and now going to perform the guide as well. Thanks and we would like to know your experience as well.